January 22, 2016 By This post may contain affiliate links. 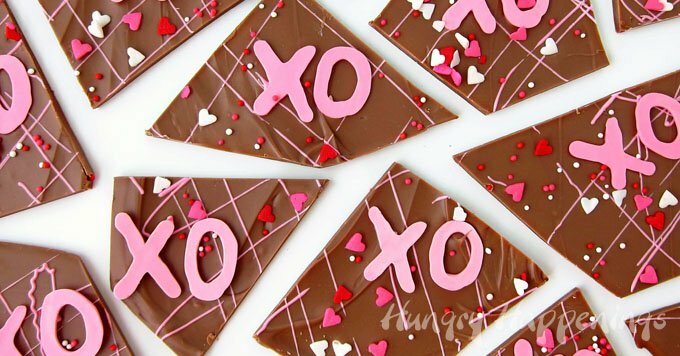 Show your loved ones how much you care by making them some Hugs and Kisses Chocolate Bark. 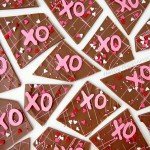 This sweet milk chocolate bark is sprinkled with bright pink X’s and O’s and is a perfect Valentine’s Day treat. 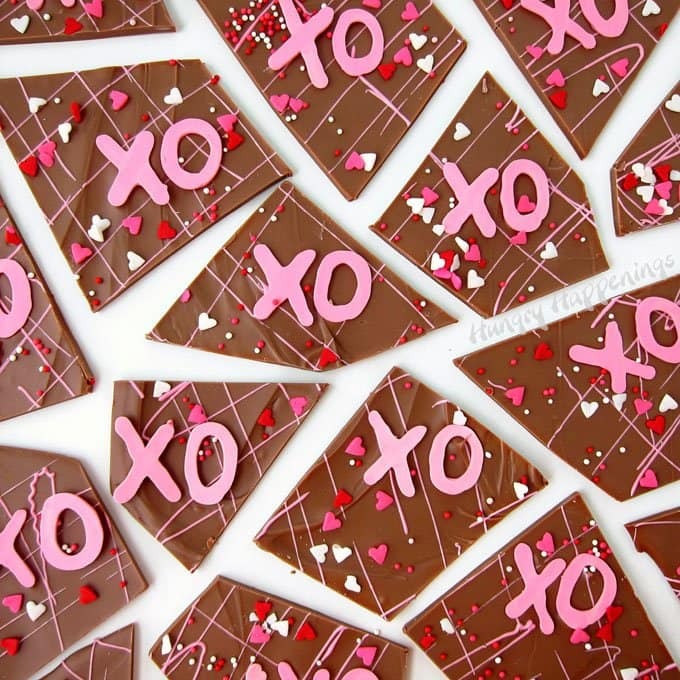 Turning chocolate into bark is one of the easiest ways to make homemade chocolate, so let’s take it a step farther and top it with some white chocolate X’s and O’s along with lots of red, white, and pink heart sprinkles and some nonpareils for a bit of crunch and color. In the time it would take you to drive to the store to buy a box of Valentine’s Day candy, you can have batches of this festive candy made to give as gifts for Valentine’s Day. To make this bark, you can use pure milk chocolate which needs to be melted and tempered or light cocoa confectionery coating (candy melts) which can simply be melted. 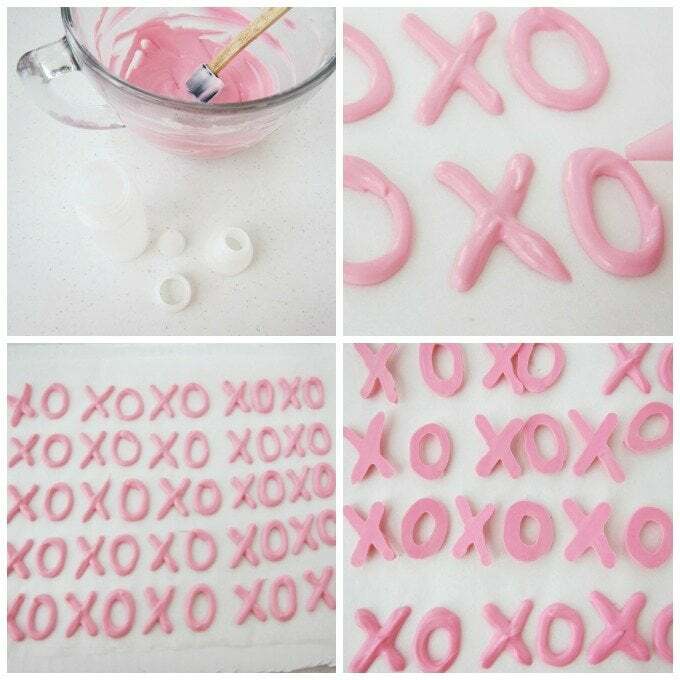 Likewise, you can use pure white chocolate or candy melts to make the X’s and O’s. If you use candy melts, you can buy them already colored pink or color them yourself. Just be sure you use candy coloring that is specifically made to color chocolates. Candy coloring is oil based, as apposed to water based, like those used to color icing. If you use icing coloring the chocolate will thicken up and you’ll need to add paramount crystals to thin it out. You can find detailed information about selecting chocolate, melting chocolate, coloring chocolate, and thinning out thick chocolate on my Chocolate Making Tips page. To make the Hugs and Kisses Chocolate Bark, start by melting the pink chocolate. Then pour it into a squeeze-it mold painter (a small squeeze bottle fitted with a pastry tip that has a very small opening) or a pastry bag or zip top bag. Pipe X’s and O’s onto a parchment paper lined baking sheet. Make them about an inch tall. Pop them into the refrigerator for a few minutes until they harden. Peel them off the parchment paper and let them sit to warm up to room temperature before making your chocolate bark. Reheat the pink chocolate so that you can use it to drizzle over the chocolate bark. If using a squeeze-it bottle, use a toothpick to clean the hardened chocolate out of the pastry tip. To make the bark, spread milk chocolate into an even layer on a parchment paper lined baking sheet. Immediately while the chocolate is wet, drizzle on some pink chocolate and press the X’s and O’s around the bark, leaving enough room to make cuts. Then toss on some red, white and pink heart sprinkles along with some nonpareils. If using pure chocolate, let the bark sit at room temperature just until it is set but still soft. If using light cocoa confectionery coating (candy melts) refrigerate for 1-3 minutes, until it’s set yet still soft. Cut into pieces then pop in the refrigerator for about 10 minutes until hardened. This sweet Hugs and Kisses Chocolate Bark will keep for several months, if kept in a cool dry place. 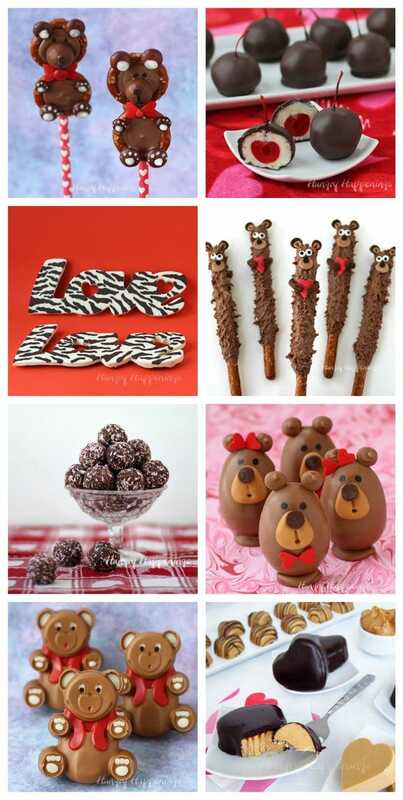 So, go ahead and get some made now so you have plenty for Valentine’s Day. Milk chocolate bark topped with bright pink X's and O's, heart sprinkles, and nonpareils. *You can also use white chocolate or white confectionery coating. Color it using pink candy coloring. Pour it into a squeeze bottle or pastry bag fitted with a small round pastry tip. Pipe inch size X's and O's onto a parchment lined baking sheet. Refrigerate for about 3 minutes until hardened. Remove from parchment paper and let sit to warm to room temperature. Melt and temper pure milk chocolate or melt light cocoa candy melts. Spread onto a parchment paper lined baking sheet. Immediately, drizzle with pink candy coating. Press X's and O's on top, leaving room to make cuts around each set. Toss on heart sprinkles and nonpareils. If using pure chocolate, let sit until it sets but is still soft. If using confectionery coating, refrigerate until set but still soft, 1-3 minutes. Cut chocolate into pieces, then refrigerate for 10 minutes until set. I’m just loving all the designs in chocolate bark, so simple, but has quite a WOW factor. The possibilities are endless! Thanks, Kim. I love how easy it is to make chocolate bark and it’s really fun to decorate it! 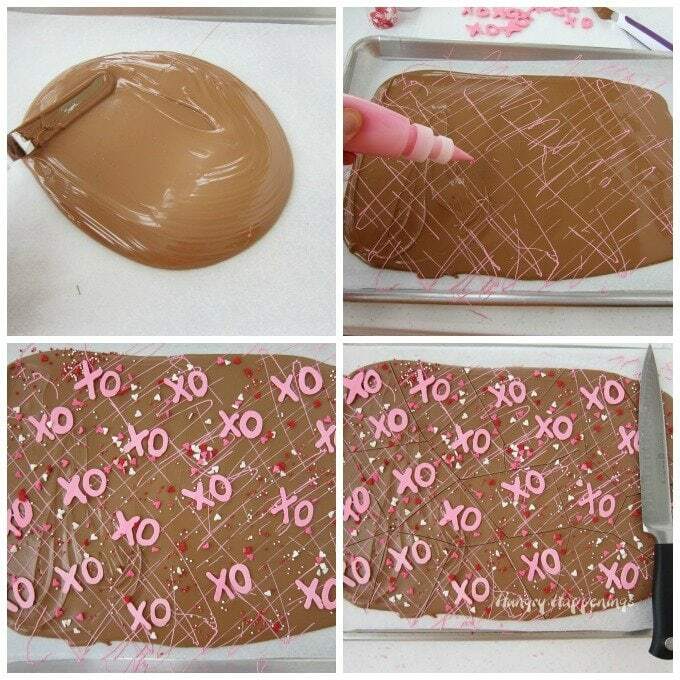 I have been wanting to make some fun chocolate bark and your hugs and kisses candy is so pretty. Oh, what a sweet story. I am so happy to have brought up such good memories for you. It’s so wonderful that you were pen pals. That is sure a lost form of communication.